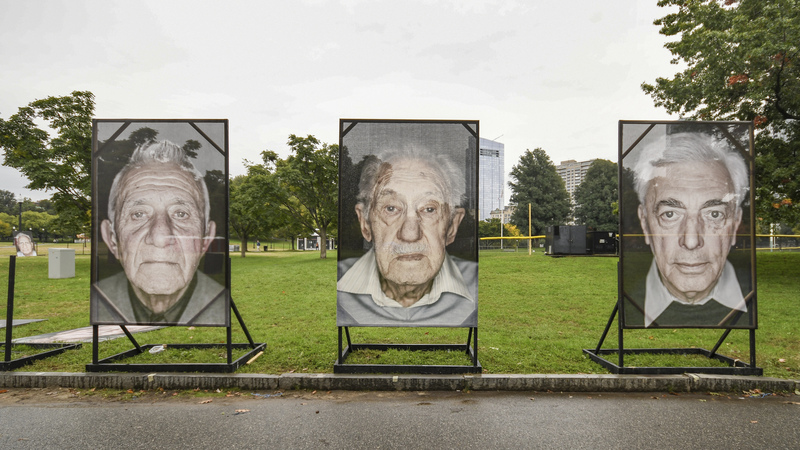 LEST WE FORGET is a touring public photo exhibition by Luigi Toscano that features largescale photographs of Holocaust survivors. The artist traveled throughout Germany, the United States, Ukraine, Israel and Russia, meeting survivors and taking their portraits. Now, these portraits are being put on display in cities all over the world, always free, and always in accessible public spaces. A special segment of the project’s tour begins this week. From April 2nd to April 13th, Toscano will drive the full width of the continental US, stopping along the way to meet American survivors of the Holocaust and discuss the LEST WE FORGET project with university students and visitors at major Holocaust memorial museums. While on the road, Toscano is collecting signatures on his bus to stand united against “all forms of exclusion, discrimination, antisemitism, and racism.” He will meet the oldest protagonist featured on his project, survivors of last year’s shooting at the Tree of Life Synagogue in Pittsburgh, and a chief of a Native American nation in South Dakota, among others. The artist’s journey culminates in a public exhibition at the Civic Center Plaza in San Francisco, California, opening April 17th. Those who can’t make it to a stop on the tour can still learn more about the images and the people behind them in the forthcoming documentary LEST WE FORGET. Read more about the project and these moving stories here. As a part of Wunderbar Together, Meg Stuart is bringing her unique style of movement and dance to the United States with a week of performances at the Walker Art Center in Minneapolis, Minnesota.